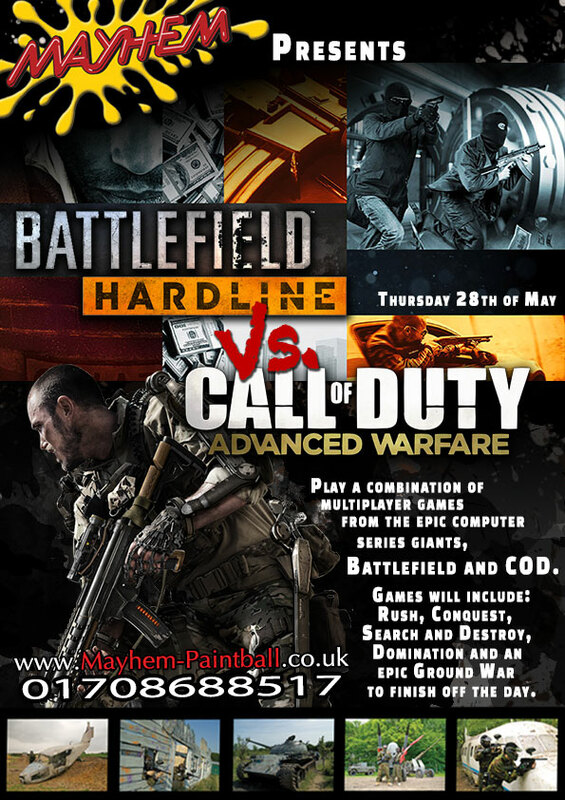 During the upcoming school half term, Mayhem will be hosting a special scenario day based on the epic computer games Call Of Duty and Battlefield. We will be playing a variety of different multiplayer game missions from both games on our movie set playing areas, including of course our replica COD map. If you book and pay in full by Monday for any pre-pay package, and use promo code: BATTLECOD at the checkout, and you will get £4 off of our pre-pay package deals. Objective – The shed labelled bank will contain duffel bags. Attacking team starts at Japanese end, their objective is to go to the bank and plant the drill (Black case) and take the duffel bags back to their base to win. After planting the drill a marshal will set off a smoke grenade to signal the planting and the duration of the smoke grenade indicates how long the drill takes to crack open the vault. After that the attacking team must take the bags to their base to win. The defending team have to either hold off the attacking team for 15 minutes or eliminate the entire team. Objective- Three double ended flags to be placed around the field. On the tank, the green jeep located by bog and the Plane in the middle. Teams will be assigned a flag and they must have the most flags up at the end of the 15 minute time period. Defending(Criminals): The defending team must either Eliminate the enemy VIP by headshot only or to stop them from getting the VIP to the helicopter in the assigned time limit. Defending team (Criminals): The defending team will start in the fort, there will be two hostages (dummies) for them to defend, one in the fort and one on the bridge. Their objective is to stop the attacking team (Swat) from rescuing the hostages. They will need to defend the hostages for 15 minutes. Attacking team (Swat): The objective of the attacking team is to go and rescue the hostages from the defending team. They must rescue one of the hostages and return it to their base. They have 15 minutes to do this and will have smoke grenades placed by marshals to help their progress. Each team will have a coloured armband (Red or yellow this is not their team tapes) When a player is eliminated they must take the armband off and drop it in the spot they were eliminated in. After a player is eliminated, live players can collect the arm bands and they count towards the final total. First team to 50 armbands wins.